It’s a different life back here. There are no windows, because light is detrimental to museum objects. We have our own separate climate control system, because heat and high humidity are detrimental to museum objects. So is low humidity. So if you see us blinking owlishly in the light and wearing long sleeves during a 90 degree heat wave, you will know from whence we come. So, you’d like to hear about a typical day in the life of a collections person? Sorry, there’s no such thing. I’m designing a storage mount for a WWII gas mask. I’ve been doing this for about two weeks. I get to work on it, oh, maybe 10 minutes at a time, in between labeling a collection of hairpins, packing some Victorian era women’s clothes with acid-free tissue in acid-free boxes, updating the collections database, doing condition reports on the prints for the upstairs hallway exhibit, visiting a potential donor’s home to look at a collection of WWI-era baby clothes, getting a quote on having some posters framed, updating the database, supervising the volunteer doing data entry from our old catalogue cards, cleaning the Hezekiah Alexander House, washing the gloves we use to handle collections objects (mild detergent, rinse twice, no fabric softener and don’t let the cats sleep in the bag), updating the database, ordering new sleeves and boxes for the postcard collection, attending planning meetings, doing the homework for planning meetings, photographing a beaded jacket and purse, steaming out creases in a quilt, discussing the exhibit calendar for the next three years with Kris, oh, and did I mention updating the collections database? It’s not a boring job. You get to work with other people; then you get to weasel away by yourself for hours at a time. You get to be creative, you get to build things, you get to handle all the neat stuff, you get to do research, you get to solve problems, you learn new things every day, you get to work with like-minded folks – fellow employees, interns and volunteers. Oh, and did I mention…..oops, wrong paragraph. You have to be precise and detail-oriented to a fault. You have to be organized but also very flexible. And you aren’t allowed to eat lunch at your desk. Ever. I will be writing here about some of the things, old and new, that reside on shelves or sit in crates in a museum. And about some of the processes and procedures for taking care of them. So many people have no idea what goes on behind the locked doors of a collections departement. 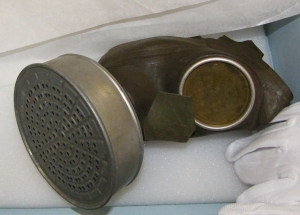 You’ll find me trying to build a mount for this poor gas mask; or, updating the collections database. Me encanta que finalices con un Shanti. Ich liebe es, dass Sie sich mit Shanti verabschieden. In one of my other lives, I was a yoga teacher. One of many other lives. In einem meiner früheren Leben war ich Yoga-Lehrerin. Eines meiner vielen früheren Leben. What they love in a museum. Como manipuladora [de objetos de colecciones de arte] me siento agradecida por trabajar con muchos e increíbles gerentes de colecciones. Su incansable trabajo se se puede apreciar cuando uno como Persona tiene la buena suerte de descubrir lo que ama en un museo. Als Kunstspediteurin hatte ich das Vergnügen mit einigen fabelhaften Sammlungsmanagern zusammenzuarbeiten. Ihre rastlose Arbeit weiß man zu schätzen, wenn man das Glück hat, zu entdecken, dass man Museen liebt. Lisa, I’ve worked with some pretty amazing art handlers and preparators. And I have had the good fortune, indeed, to discover museum work. Like one of my previous careers, calligraphy, it allows you creative use of both mind and physical skills. We work hard, but we’re a lucky bunch. Lisa, he trabajado con algunos muy impresionantes manipuladores y embaladores de arte, y he tenido la gran suerte, sin duda, de descubrir el trabajo museístico. Como en una de mis previas carreras profesionales, la caligrafía, éste te permite un creativo uso tanto de la mente como de las destrezas físicas. Trabajamos duro, pero somos un grupo afortunado. Lisa, ich habe mit ein paar wirklich fabelhaften Kunstspediteuren und Ausstellungstechnikern zusammengearbeitet. Und ich hatte das wirklich große Glück, die Museumsarbeit für mich zu entdecken. Wie eine meiner früheren Karrieren, die Kalligraphie, ermöglicht sie die kreative Verknüpfung von geistigen und körperlichen Fähigkeiten. Wir arbeiten hart, aber wir sind ein glücklicher Haufen! I agree with Angela, by the following: when working with the museum collection and studying an object one examines a mechanical and technological dimension in a way that is not limited to the use and mechanical purposes of the object only, like mechanical technicians do. In the museum’s collection, registrars tackle its material dimension, mechanical purpose and also its cultural context; they go into detail, like a Swiss watchmaker. And there is much that we must care for: codification (varnish-paint-varnish), labels, input references, study materials, packaging and placement in the storage area, consider things like weather conditions and adequate lighting, etc. Our computerized databases may contain just as much technical data as the data base of a technician, but many more fields for other information. Mechanical technicians do not need all that, because their role is to make our bikes work well. For them, the work of the collections manager or registrar looks boring, like it is for us to watch them dismantling and assembling engines. We both do an indispensable role, and we measure with different value scales. para su codificación (barniz-pintura-barniz), etiquetas, referencias de entrada, estudio de materiales, embalaje y colocación en depósitos con condiciones climáticas y de iluminación adecuadas, etc. Nuestras bases de datos computarizadas tienen MUCHOS MÁS CAMPOS de información que las de los técnicos mecánicos. Los técnicos mecánicos no necesitan hacer todo eso, pues su rol es hacer que nuestras motocicletas funcionen bien. Si para ellos nuestro trabajo de registradores de colecciones es aburrido, para nosotros lo es más verlos a ellos desarmando y armando motores, aunque ambos tenemos un papel indispensable, y nos medimos con escalas de valores diferentes. Of course, as a collection manager of a science and technology museum I have to slightly disagree with Fernando. For us, it’s never boring to watch an engine being dismantled and re-assembled. It’s one of our sources to learn about the objects we are working with. And this takes me a step further from the previous comments. Sure, watching mechanics at work creates a sense of wonder. A great starting point. But if we want to have great, innovative and intelligent mechanics in the future, we have to go the step further and tell the people, especially young people, what they see. De hecho, como gerente de colecciones de un museo de ciencia y tecnología tengo un leve desacuerdo con Fernando. Para nosotros, nunca es aburrido observar un motor que esté siendo desarmado y re-armado. Esta es una de nuestras fuentes para aprender acerca de los objetos con los que trabajamos. Natürlich muss ich als Depotleiterin eines Technikmuseums Fernando da ein bißchen widersprechen. Für uns ist es nie langweilig dabei zuzusehen, wie ein Motor auseinander- und wieder zusammengebaut wird. Es ist eine der Quellen, bei denen man etwas über die Objekte lernt mit denen wir zu tun haben. Und das führt mich noch einen Schritt weiter weg vom Ursprungskommentar. Natürlich, Mechanikern bei der Arbeit zuzusehen kann das Gefühl erzeugen, einem Wunder beizuwohnen. Das ist ein großartiger Ausgangspunkt. Aber wenn wir zukünftig großartige, innovative und intelligente Mechaniker haben wollen, dann müssen wir einen Schritt weiter gehen und den Leuten, besonders den jungen Leuten, erklären, was sie sehen. ” So many people have no idea what goes on behind the locked doors of a collections department.” Perhaps, it is time to bring those functions into public view. In a typical museum, motorcycle shop, auto dealership, appliance store, etc, the mechanics/technicians, like us, usually conduct their work walled away from public view. I recall the Slegers-Forbes motorcycle in Whippany, N.J. caused quite a sensation in the 1970s when they separated the showroom from the shop with a glass wall! The public could witness the work and the mechanics could concentrate on their duties. The few times I was at Slegers-Forbes, there where aways people glued to that glass, and gaining a real appreciation for the work on the other side, which shocked me because action was so slow in the shop, with the mechanics meticulously adjusting or torquing this or that. Perhaps it is time to expose that 90% of the work done in our museums to public view with a similar arrangement. “Mucha gente no tiene idea de lo que sucede tras las puertas cerradas del departamento de colecciones”. Tal vez, pero es tiempo de llevar esas funciones a la vista del público. En un museo típico, o en una tienda de motocicletas, ventas de autos, tiendas de accesorios, etc., los técnicos/mecánicos, como nosotros, usualmente hacen su trabajo separados de la vista del público por medio de paredes. Recuerdo el Slegers-Forbes motorcycle in Whippany, N.J., que causó total sensación en los años 70 cuando ellos separaron el área de exposición de la de la tienda ¡con una pared de vidrio! El público podía ver el trabajo y los mecánicos podían concentrarse en sus tareas. Las pocas veces que yo estuve en la Slegers-Forbes, vi que había varias personas pegadas al vidrio, obteniendo una real apreciación del trabajo hecho en el otro lado, lo cual me impresionó pues la actividad en el sitio era tan lenta, con los mecánicos ajustando o torsionando meticulosamente esto o aquello. Tal vez es tiempo de exponer a la vista del público ese 90% del trabajo hecho en nuestros museos, con una disposición similar. to show what work is done behind the scenes was one of the initial thoughts that started this blog. In fact, there are some museums that offer a window to their collections where visitors can look into a selected storage area and can even spot a registrar working from time to time. Of course, it won’t work like in the garage you describe. There are too many security issues involved. Plus, seeing a car mechanic explains itself in many ways. Seeing a registrar staring and typing in a data base doesn’t. Mostrar el trabajo que se hace tras bastidores fue una de las consideraciones iniciales que motivaron este blog. De hecho, hay muchos museos que ofrecen una ventana a sus colecciones, a través de la cual los visitantes pueden ver una área seleccionada de almacenamiento, e incluso de vez en cuando pueden avistar a un registrador trabajando. Claro, eso no funcionará como en el garage que tú describes. Hay demasiados asuntos de seguridad involucrados. Además, ver a un mecánico de automóviles es algo que se explica por sí mismo de muchas maneras. Ver a un registrador mirando y escribiendo en una base de datos no lo hace. Au contraire, most of what makes our technological world work is, in reality, magic to most people. They know how to use it. They may know what it does. But, do they actually know how and why it works at the component level? Observing a mechanic/technician troubleshooting a problem on – you pick a product – by staring at computer or meter screens is not really that much [different] than observing a registrar process metadata on an object. As Paul noted, seeing the effort and tedium that registrars expend as they type details into a data base that makes the user’s computerized access so easy and creates the interpretive exhibit signage can only expand their appreciation. – sense of wonder! Al contrario, la mayoría de las cosas que se hacen en nuestro mundo tecnológico en realidad resultan mágicas para mucha gente. Ellos [los técnicos/mecánicos] saben cómo usarla. Ellos pueden saber cómo funciona. Pero, ¿no saben ya ellos cómo y porqué funciona cada componente? Observando a un técnico/mecánico en plena resolución de un problema -elige tú el caso-, mirar fijamente a la computadora o a un instrumento de medición no es realmente muy diferente a observar el trabajo del registrador procesando la data de un objeto. Como observara Paul, es muy fácil ver el esfuerzo y el tedio que los registradores emplean al escribir información en una base de datos computarizada que facilita el acceso del usuario, y eso contribuye a crear la gestualidad interpretativa de una exposición, lo cual amplía la capacidad de apreciación. ¡Maravillante! I totally agree that nowadays the daily work of a mechatronic troubleshooting a problem looks very much like the work of a registrar, it’s working with a computer. But that takes them both on the same level: when you watch what they do, you don’t understand what they do. While this may lead to a level of appreciation and wonder like you say, it can also backfire. If you watch our work without explanation, you may wonder why we work so incredibly slow. Why we not just write the number on the artifact and off it goes, but take the effort to add a layer of varnish first, let it dry, then paint the number and then add again a layer of varnish. Why we bother to leave something unpacked until we are sure what material it is exactly made of to avoid damage by the wrong packing material. The things we do are based on research, long-term experience and the knowledge that we are working with irreplacable originals. Though, in a world trained to look at working processes with the eye of “where to cut costs” I think you shouldn’t let people watch a registrar without him/her having the chance to explain what he/she does and why – or with a professional educator at hand who explains it. Estoy totalmente de acuerdo con que hoy día la diaria resolución de problemas en la mecatrónica se parece mucho al trabajo del registrador: es un trabajo con computadora. Pero lo que les pone a ambos en el mismo nivel es que cuando ves lo que hacen, no entiendes lo que hacen. Si bien esto puede llevarnos a un nivel de apreciación y maravilla, como tú dices, también puede ser contraproducente. Si observas nuestro trabajo sin recibir ninguna explicación, te podrías preguntar por qué trabajamos tan increíblemente lento. Porque no solo escribimos el número sobre el objeto y listo, sino que nos tomamos el esfuerzo de agregar una capa de barniz primero, dejándola secar, y luego escribimos el número para después agregar otra capa de barniz. Y porque nos fastidia dejar algo desempacado si no estamos exactamente seguros del material con el que está hecho, para evitar daños que cause el uso de un material de embalaje equivocado. Las cosas que nosotros hacemos se basan en la investigación, en la prolongada experiencia y en el conocimiento de que estamos trabajando con materiales ireemplazables y originales. Aunque estemos en un mundo entrenado para mirar los procesos de trabajo con ojo de “dónde recortar gastos”, creo que no se debe dejar que la gente vea a un registrador sin que él o ella tengan la oportunidad de explicar lo que están haciendo y por qué lo hacen, o al menos sin contar con un educador profesional a la mano que lo explique.